If you are a horror movie fan, you won’t want to miss this new horror film - You’re Next. Maybe you have watched it in theatre on August of this year and decided to buy a DVD. There’s good news for you.DVD You’re Next will be released on Jan 24, 2013. Let’s talk about this film. After that, I want to share you guys the easiest and fastest way to copy DVD You’re Next. Thus you can play it on your tablet or smart phones at your fingertips. The filming process took place over four weeks, and were mostly night shoots filmed from 7pm to 7am.But as a low-budget film, You’re Next is thought to be a success. It opened to $7 million on its opening weekend which was 7 times its budget. And the film has so far earned over $25 million. In the meantime, You’re Next received positive reviews from film comments, which was given a score of 75% based on 131 film critics by Rotten Tomatoes.It’s considered as one of the smartest and most terrifying films in years. From the site’s consensus states, “This film’s energetic and effective mix of brutal gore and pitch black humor will please horror buffs and beyond”. Nowadays, tablets are getting more and more popular than ever. According to the Pew Research Center's Internet and American Life Project, over a third of American adults now own a tablet. It’s really cool to enjoy our favorite DVD movies on our tablets. But unfortunately, the tablet does not have a DVD-ROM. You might download movies but the Wi-Fi/3G network speed isn’t always fast. And the video quality can’t be guaranteed. So it’s really necessary to use a professional DVD ripping tool. 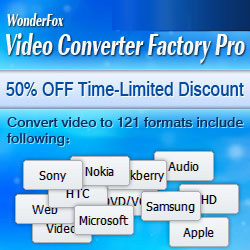 WonderFox DVD Video Converter is the perfect one that I’ve used for a long time. It can easily enable you to backup DVD You’re Next, for example, and convert You’re Next to tablet. We can have a try. Keep reading! The following guide is to teach you how to copy DVD You’re Next or any other latest protected DVDs, such as Don Jon, The Mortal Instruments: City of Bones, The Wolverine, Pacific Rim, Despicable Me 2, etc as well as the classic ones with just a few clicks. To copy DVD You’re Next, make sure you have downloaded this program and install it on your PC. And thanks to the hardworking of WonderFox guys, this program is more than a toolbox, integrated with a DVD ripper, video converter, online video downloader (YouTube, Vimeo, Facebook, Liveleak, Metacafe, etc) and a video editor. Note: You are supported to choose which part of the DVD movie should be copied – Main Movie or All Movies. Step 2: Open the output dropdown list and then select an ideal output format or output device. Note: It supports 100 + video formats like MP4, MKV, WMV, MOV, 3GP, FLV, ASF, etc and portable devices including iPhone 5S, iPhone 5C, iPad mini, Samsung GALAXY Note 3, Samsung GALAXY S4, BlackBerry PlayBook, Nokia, PS3, PSP and any more. 1. Convert SD video to HD video with excellent video audio quality. 2. Video editing functions like trimming, cropping, adding special effects. 3. Drag video or audio files into the program effortlessly. 4. For advanced users, you can set video encoder, resolution, bit rate, frame rate and audio encoder, bit rate, sample rate to meet your unique demands.